Ah, the elderly. They're no longer content to watch re-runs and take walks. In Japan, they're hanging out in arcades. Lower birth rates haven't helped Japanese game centers. "These days, it's become harder to target young males," Japan Amusement Industry Association tells Japan's Nikkei. Arcades, like Tokyo's Sega Dream Factory, are having better luck with a less likely group of gamers: the silver set. Senior citizens make up a third of Sega Dream Factory's customers. Arcades with strong senior showings are even running special deals for elderly gamers such as giving them more tokens if they spend ¥1,000, or offering them blankets if they get cold. "Recently, I've been coming with my grandchildren, but it's like a dream," says one 65-year-old arcade goer. "I'm so busy making friends, I feel rejuvenated." According to one arcade manager, the number of elderly people inquiring about how to play arcade games is increasing. The elderly find game centers appealing for a variety of reasons that range from the fact it's easy to make friends to the way it's a good place to get out of the house and to use one's brain and eye-hand coordination". 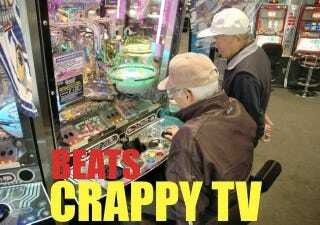 Old Japanese gamers primarily enjoy medallion games, pachinko games, crane games and horse racing games. "I sometimes spend a little over ¥,1,000 (US$12) a day on horse racing and pachinko," says a 73-year-old gamer. "I keep coming back because it's cheap to play." The senior citizen gamers bring their own boxed lunches into the arcades to eat with friends and hangout from morning until evening, just showing that as our lives become increasingly online, there is something that can never replace arcades: meeting other gamers face-to-face.